Defense is the best part about football. Everyone loves offense and wants to be a “star”, but it’s defense that wins championships and it’s defense that wins mud and slush Bowls. If you don’t love defense, please EXIT now! 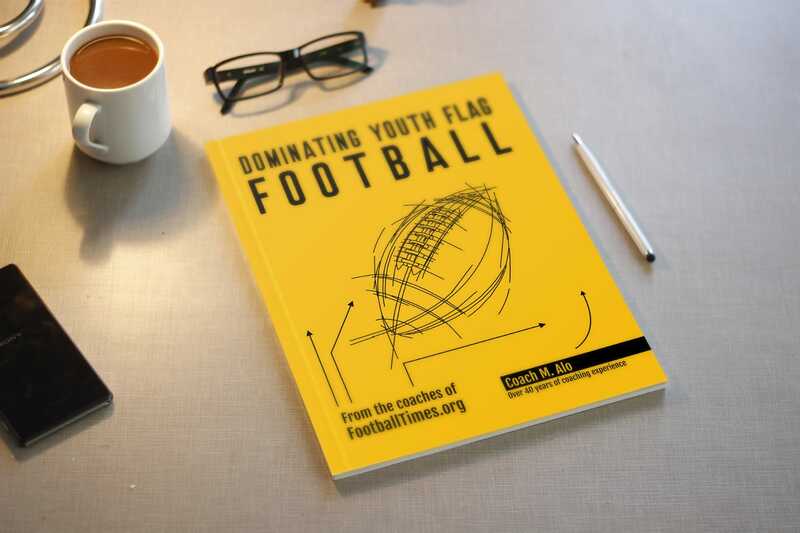 You can also read our 7 on 7 Flag Man Coverage article. In flag football, it is extremely crucial that everyone swarms to the ball. Why? If the first person misses or doesn’t pull the flag, the others have to pull it. Defense in flag football is very tight and exact. There is a lot of room to screw up. Make sure you have everyone pulling the flag. Don’t assume that the first guy there will always get the flag. In the zone scheme, the cornerbacks (CB) are playing short zone coverage. While the safeties (S) are playing deep zone. The linebacker (LB) in this situation is extremely crucial and is playing a modified zone. Two of the LBs have to rush the QB (see the arrows). Rush like mad! In this scheme, everyone’s role is as important as everyone else’s. Everyone has to know what to do in each situation. Especially in flag football. It’s not about size and strength, it’s about speed and intelligence. Do they know who to cover and when? Assignment football always beats better athletes. A detailed description of each role is explained below. Corners have to guard the short zone. That means if the wide receiver is in the zone, cover him. If a motion comes to your side, cover it. If the quarterback decides to sneak to your side, cover him. Your job is to contain the QB if he likes to take off running. It’s a very difficult job, but stay short and stay on your side. If a player you are covering goes to the middle, leave him for the linebacker. If your player goes deep, let the safeties deal with him. These guys need to be the fastest players. Rush the QB like mad. The linebacker (LB) may also line up with you and pretend to rush, but will ultimately drop back to cover the QB or any lineman that release for a pass. The linebacker may blitz, consult with safety. Switch the D-line players often if you have subs. Their job is tiring, and having fresh legs is a must. Every two downs, is optimal for subbing D-line players. Being fast and fresh is the key. No O-line or QB will be able to take this type of punishing pressure down after down. Let them get tired, not you. Also, you can alternate which two LBs rush. You can both line up on one side or the other, or pretend not to rush at all. Use all the tricks you can think of. If you sub a lot of guys in as LBs to rush, the better you will be at sacking the QB. Watch the QB and don’t let him run. Roll to the right when he does, and cut off all running lanes. In flag football, QBs love running, and if no one is watching, the QB will get a lot of yards on you. The Linebacker will also have to pick up offensive linemen that go out for a pass. Danger: The QB may fake a run out to one side, drawing the linebacker with him, and then an offensive lineman releases for a pass on the other side. The safety will have to be watching this, and run up to make the play. Linebackers and safeties have to know their positions, coordinate and talk to each other. The game will be won or lost by the play of the Linebackers and Safety. The Safeties in zone coverage have to cover deep routes. The CBs will cover short routes out in the flats, while the linebacker covers short middle. The safeties have to cover deep. If a wide receiver is getting open deep, the safety on that side covers. Never let an player get behind you. Keep them all in front of you. Watch the QBs eyes to know where he is looking. If the QB goes for a run, don’t bite hard until he crosses the line of scrimmage and is committed to running. Then go after him. If an offensive lineman goes out, the linebacker will cover him short, while the safety picks him up deep. If the linebacker sees a nice blitz opportunity, he can tell a cornerback to blitz, while he picks up the slack. If a corner blitzes, the linebacker covers the now open wide receiver short, and safety covers him deep. Can a safety blitz? Sure, because he is the extra guy, but be careful in zone. Let the other safety know, so he can watch both sides. 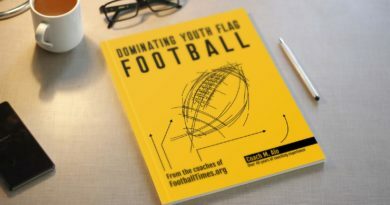 Don’t forget to grab out Dominating Flag Football book from Amazon!